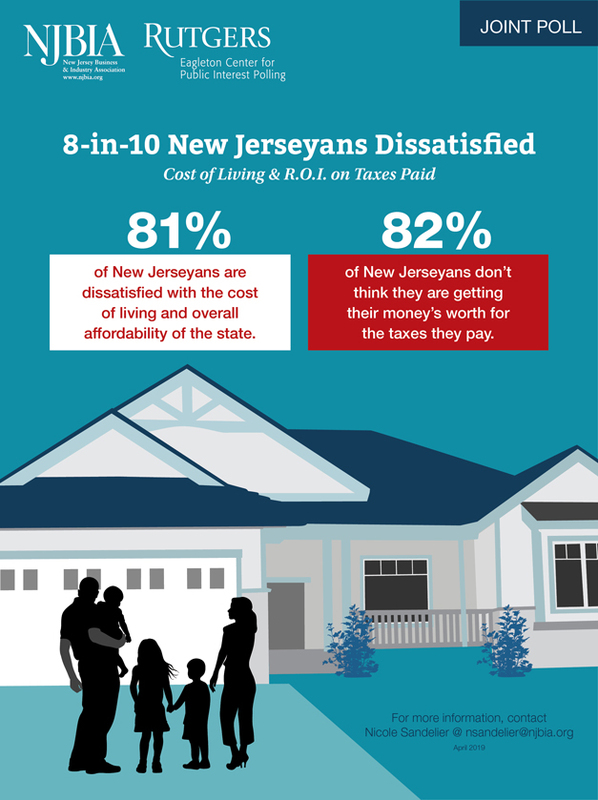 A Rutgers-Eagleton Poll released today, in conjunction with the New Jersey Business & Industry Association, finds most New Jersey residents feel they pay too much in taxes and are displeased with how state government is addressing affordability in the Garden State. As Tax Day approaches and higher taxes are once again considered as part of the FY 2020 budget, 82 percent of residents think they pay too much for taxes for what they get. Moreover, New Jersey residents feel state government is not doing much to relieve the financial pressure. About eight in 10 are either somewhat or very dissatisfied with how the state government is handling the cost of living and affordability (81 percent) and how the state government is handling taxes (78 percent). Over half are unhappy with how the government is doing with the state budget (57 percent) and business and employment opportunities (52 percent). 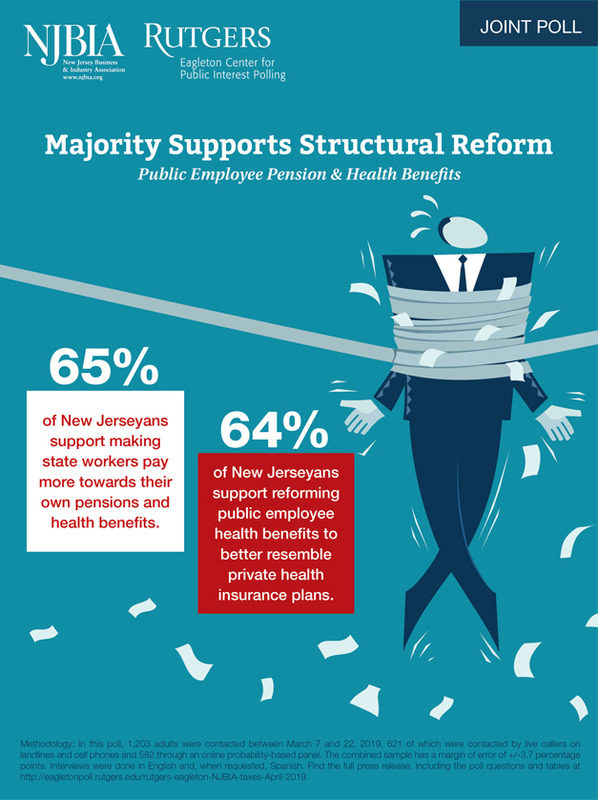 NJBIA has called for structural reforms to relieve New Jersey’s current pension crisis. To that end, 89 percent of respondents say they don’t want taxes raised in order to fully fund the pension system. Instead, 65 percent of residents would rather see state workers contribute more to their own pensions. Additionally, 64 percent said public employee benefits should more closely resemble private health insurance plans. “NJBIA believes this poll completely validates the need for immediate structural reforms in the state of New Jersey,” said NJBIA President and CEO Michele N. Siekerka Esq. “There is no doubt that the tax-and-spend actions that we have seen over the past year will not come close to solving our financial crisis. New Jerseyans have grown more frustrated over time with how state government is handling a host of issues. Residents have not wavered in their overwhelming negativity toward the job Trenton is doing regarding taxes and the cost of living in the state, but dissatisfaction has increased by double digits when it comes to business and employment opportunities: 52 percent are now very or somewhat dissatisfied with the state’s handling of this issue, compared to 41 percent before Governor Murphy took office. Large majorities believe the taxes they pay – namely, property taxes (79 percent), the 41.4 cent gas tax (77 percent), and state income tax (62 percent) – are unfair. Only the sales tax sits well with residents, with over half (58 percent) saying the tax is a reasonable one. While views on how the state is handling government spending and the budget have improved, residents are still more negative than positive (57 percent to 42 percent), but by a much smaller margin compared to November 2017, with satisfaction increasing by more than 20 points and dissatisfaction dropping by the same amount. When it comes to fully funding the pension system, few are in favor of tax increases as a viable solution; In fact, residents are even less likely to support this option – by double digits – than they were three years ago. Additionally, support never reaches higher than 18 percent in any demographic group. Support is widespread, on the other hand, when it comes to funding the pension system through asking workers for greater contributions and revising their health plans. A majority of every demographic supports each of these options. “New Jersey currently has $151 billion in pension liabilities and post-employment benefit obligations,” Siekerka added. “Our long-term debt obligations have grown 382 percent over the last 10 years. To think we can tax our way out of this is fiscally irresponsible and to the detriment of our residents. In this poll, 1,203 adults were contacted between March 7 and 22, 2019, 621 of whom were contacted by live callers on both landlines and cell phones and 582 through an online probability-based panel. The combined sample has a margin of error of +/-3.7 percentage points. Interviews were done in English and, when requested, Spanish. Find the full poll tables here. I think Murphy has to start think straight and stop protecting his legal weed business ! That all he cares!